I was thoroughly surprised to learn that this was Bethesda’s first E3 presser. It was handled deftly and was entertaining enough to hold my attention (compared to those of some of their peers that were either just tonally off or totally off). 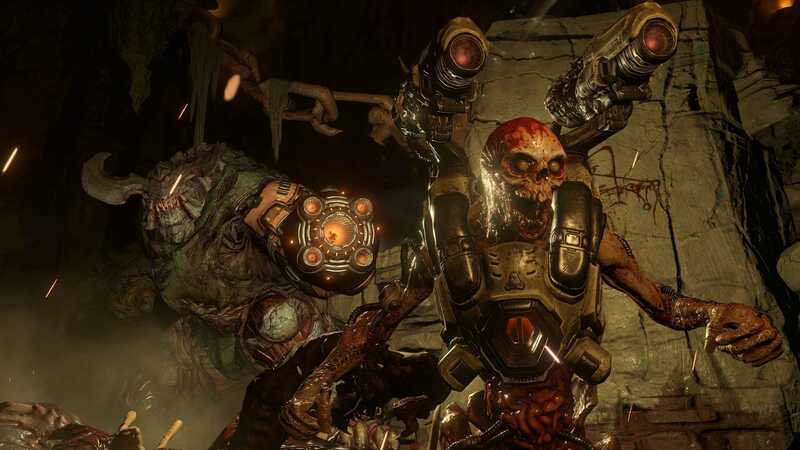 The new DOOM gameplay was very impressive; it’s nice to see it expand beyond its predecessor’s tight, dark corridors with only a couple of enemies. The larger environments make it easier to get back to old-school DOOM as I remember it: rushing headlong into tons of enemies as fast as possible, strafing, etc. The new suit makes the HUD look cool and intuitive — and I like the extra capabilities it holds such as thrust jumps and so forth. The combat is appropriately brutal for a DOOM game; each weapon seems to pack its own individual punch and have some heft to it. The counterattack animations are great, although I worry about how often they’ll be peppered in on the campaign. 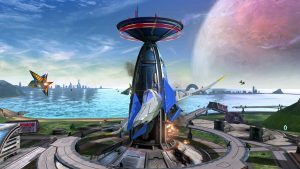 Snapmap looks like an amazing concept, and I really like the on-the-fly editing and so forth; it’ll give a huge boost to multiplayer in general. On to Battlecry. This looks like a more boring Team Fortress with an interesting aesthetic. What they put out seemed sort of cobbled together, it’ll be interesting to see what they give us next. Dishonored 2 looks solid; I like the new, more steampunkish look — and I should probably finish Dishonored already. The Elder Scrolls Online looks like a blast, and I can’t wait to do co-op via console; I’ve been curious about it since Skyrim. The Elder Scrolls: Legends looks like a card game that I will never play — even though I love the Elder Scrolls games. Now, Fallout 4. Ohhhhhhh Fallout 4. I’m totally a mark for this franchise. The concept art grabbed me, but the intro playthrough completely reeled me in. 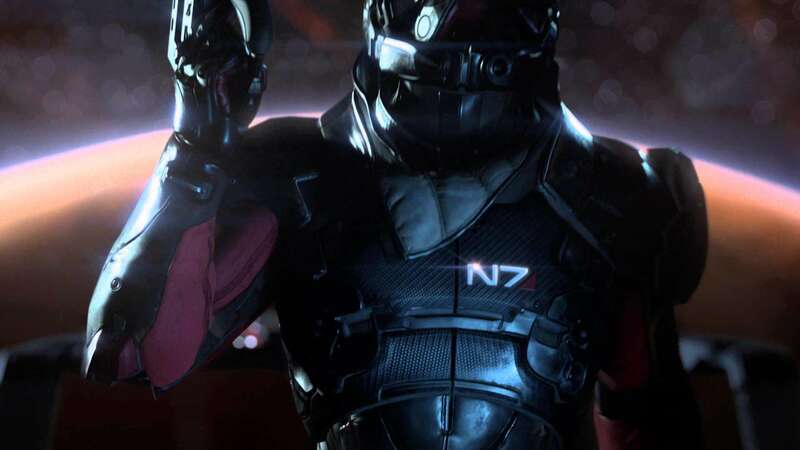 The graphics look way better — from the third-person movement of your character to the textures. The game looks way more colorful and engaging than FO3; the new VATS and Pip-Boy interfaces look slick; and I really want that Collector’s Edition Pip-Boy cellphone holder. Other than that, the aesthetic of this is just way richer; the new Vault Suits are even pretty solid. The relentless customization afforded to you once you have the proper experience looks almost overwhelming, but I feel like Bethesda nailed the actual interaction part. Fallout Shelter looks like a pretty cute extension of the experience for mobile devices. Solid intro — but they played their hand way, way too early with Halo 5. It looks good — retaining a lot of the Halo charm without looking overly “samey” — but I still just never really gelled with the franchise. It was fun to screw around on with friends but just bored me after a while. The backwards compatibility feature was great, since that’s one of my gripes with many next-gen consoles — namely my PS3 when I first got it under the assumption that it was backwards compatible (didn’t do my homework). It sort of bums me out that this has to be a big announcement-worthy thing rather than a basic feature. Then we had Gears 4. It looks fantastic. I enjoyed the series on the 360 despite never finishing 3 (ugh, I know) — so if anything would sell me further on an XBOne, it’d be this game. It’s good to see Fenix back, for as much as a gruff, boring cipher of a character he may be. Tonally awkward overall. Started out solid with the Mass Effect: Andromeda trailer; good to see the Mako back — and the new look and scenery is interesting — but anything related to Mass Effect would get me super hyper. Need for Speed is one of my favorite franchises (not going to call it a guilty pleasure), and the new version looks appropriately cheesy and stupidly fun. The flow for the car customization interface looks almost aggressively fluid compared to the more compartmentalized customization interface of the previous games; I’d like to have a hands-on with it to see how well it works. Unravel looks astonishing and inventive. Plants vs. Zombies: Garden Warfare 2 looks cute; I wasn’t even aware that the franchise had gotten this far (only played PvZ on the phone). I think we hit the cultural saturation point with zombies about the years ago, so anything that immediately involves zombies kinda loses my interest. This looks pretty fun, though. I’d give it a shot. I don’t really have a ton of interest in sports games, so I’m going to be sorta brief with those: NBA Live 15: Face-cap gimmick looks interesting and seems to work well, the animations are fluid, and it looks like it’d be a blast if that’s your deal. Same with FIFA: I liked the involvement of Pele and that they actually have women’s league games in this now, but other than that I sort of zoned out on it. Mirror’s Edge Catalyst looks like it’s going to be a blast; I loved the first one (even though it occasionally gave me wicked vertigo), and I really like the cyberpunk look of the whole universe. Star Wars: Battlefront looks like it’s going to be awesome, and I’m not even that much of a Star Wars guy. I like the way the missions seem to be handled — and the sequences with the X-Wing and the AT/AT takedown are solid. Canadians love their live playthroughs. Apparently, Ubisoft has declared 2016 to be the Year of the Tom Clancy. Aisha Tyler was awesome as always and kept everything moving at a solid clip. First up was South Park: The Fractured But Whole. It’s a sequel to that Stick RPG — whatevs. I’m not really a South Park guy, even though I tried to get into it and I still get all of the references. Anyway, Parker and Stone showed up to talk about the new SP game very, very briefly, cussed a lot, then took off like right after the first question. For Honor had a pretty sweet trailer with knights and vikings; interesting live gameplay demo. Blane says it looks like kind of a mix of Dynasty Warriors and Chivalry, and I’d have to agree with that. 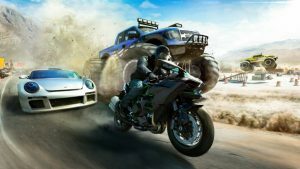 The Crew: Wild Run looks like a super sweet vehicle party with lots of cars and (MONSTER TRUCKS. Needs Truckasaurus DLC) racing modes. Big fan already — mostly because it reminds me of the huge race events from a lot of the Fast & Furious movies. The Trials Fusion add-on: We had a teaser trailer of a cat-person riding a unicorn with rainbows arcing behind them. The last Trials game I played involved a human on a dirtbike. I’m lost. TOM CLANCY’s The Division looks interesting, even though I’m not a multiplayer guy. Cool co-op, with a little treachery here and there. I can see this having a pretty big following. In the world-builder category, we get Anno 2205 — a solid-looking futuristic romp. Never played any of its predecessors because I was mostly a Sim City, etc. guy — but it looks very pretty and interesting, and I’ll likely give it a shot. The Just Dance 2016 presentation was a bit of a yawnfest; you can use your smartphones now, they’re offering a subscription service, and Jason DeRulo is not a good live performer. TOM CLANCY’s Rainbow Six: Siege looks pretty cool, even though still kinda more of the same. Angela Bassett’s in it. She came out to talk a bit, and she’s still gorgeous. They did another live playthrough; the team handled themselves well with their respective roles and seemed to have a solid tactical strategy going through the stage. Not your normal brainless shooter, which is nice. Trackmania Turbo is the intense-looking arcade racing game offering from them; it’s very bright and pretty and super fast and twisty — also available in VR, in case you haven’t puked in a while. I’m probably going to get it. From there, we have Assassin’s Creed Syndicate — which looks pretty good now that it’s a little newer. I couldn’t get into the older games (still haven’t tried the latest though). Set in London, the character design looks like the cast of Peaky Blinders and Gangs of New York mated during a steampunk festival. TOM CLANCY’s Ghost Recon Wildlands seems pretty amazing. Open-world, multiple approaches to achieve your objectives, tons of vehicles and terrain. Big fan already. They were the barn-burner of the pressers, hands-down. They kicked it off with The Last Guardian — an absolutely painfully gorgeous new offering from the makers of Ico and Shadow of the Colossus. The creature mechanics are excellent, and the lack of any onscreen display elements is a great continuation from their previous games — making it that much more immersive. I cannot wait to put this in my face. 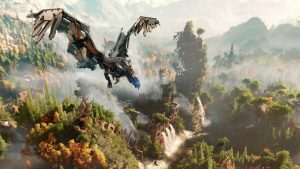 Horizon Zero Dawn is an interesting post-apocalyptic/sci-fi hybrid featuring cybernetic animals and tribes re-establishing civilization in the wreckage of society. 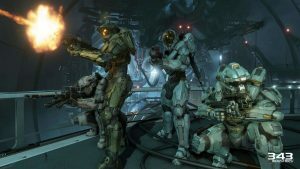 The action during the gameplay footage was fantastic; the controls look tight, the character designs are brilliant, and it looks like a genuine chore to successfully take down your sizable opponents. Hitman is an open-world version of more of the same from the Hitman series, but its facelift may hold more promise beyond its predecessors. Carrying off successful hits in the prior Hitman games was fun — but the story didn’t always grab me as much as the execution of a mission did, which is kind of a shame. Hopefully, this breaks the mold in that respect. Another strong showing was Super Street Fighter V — with a fantastic graphic overhaul, new fighters, and a solid continuation of the Street Fighter series. Now for No Man’s Sky — which is a disturbingly expansive game, from what they showed us. The universe is terrifyingly huge. According to the presenter, many of the planets in the game will go undiscovered. Navigation, scouting, and scanning seemed simple enough, and the on-planet footage looked impressive, with a ton of flora and fauna and creatures alike. The planet that we landed on had sort of a Forbidden Planet vibe to it. Following this was Dreams. I’m still not sure WHAT it is, but it looks amazing and beautiful — and I want it. Seemingly an animation studio and a game mixed into one, from what I recall? Either way, it was practically hallucinatory and amazing. After that, they shared a bit of in-game from Firewatch — which has an interesting narrative and looks to be a pretty fun first-person romp. There was some stuff from Destiny, which I’ve never really played nor have been interested in — especially since all I’ve heard from people who still play it are complaints. (Then stop playing it, stupid.) They showed an alternate Assassin’s Creed Syndicate trailer featuring Evie, the sister of the dude shown in the Ubisoft trailer — and that was a nice change. The Final Fantasy VII remake with Advent Children-esque FMV didn’t give any real details, but it definitely got me excited about the prospect. Then they showed four new games from Devolver Digital, each of which look fun enough. The next introduction blew me away. Shenmue 3 KS campaign. I can’t count how many hours I spent playing Shenmue and Shenmue 2, so a new addition to the series would be amazing. They did a brief playthrough of a section of Batman: Arkham Knight, went over the Morpheus VR feature (still can’t get into the concept of VR; need some hands-on time with it; last VR thing I touched was a Nintendo Virtual Boy), and announced Playstation Play for television streaming. Call of Duty Black Ops 3 basically looks like Call of Duty Crysis with the addition of powersuits and so forth — evidence that they’re running out of ideas, but not an audience . . . interestingly enough. Then the piece de resistance: Uncharted 4: A Thief’s End. The game looks magnificent. Practically realistic. They keep the same frenetic pace of the firefights and make the platforming still as amusing as before. The demo footage was amazing in that they actually had an Uncharted chase scene that wasn’t on rails. Nate and Sully bumping through markets and drainage ditches while evading the paramilitary truck-thing is pulse-pounding enough to watch, and it’s probably a blast to play. I can’t wait for the final product. Skated by on just being damn endearing and classic with the puppets and the Star Fox opening. Like I said to the rest of the Novy team in Slack, Nintendo makes games that I look at and think, ‘That looks fun’ — as opposed to others, where I look at them and think, ‘That looks pretty.’ Star Fox Zero, while not pretty, looks like a blast and a solid addition to the Star Fox series. 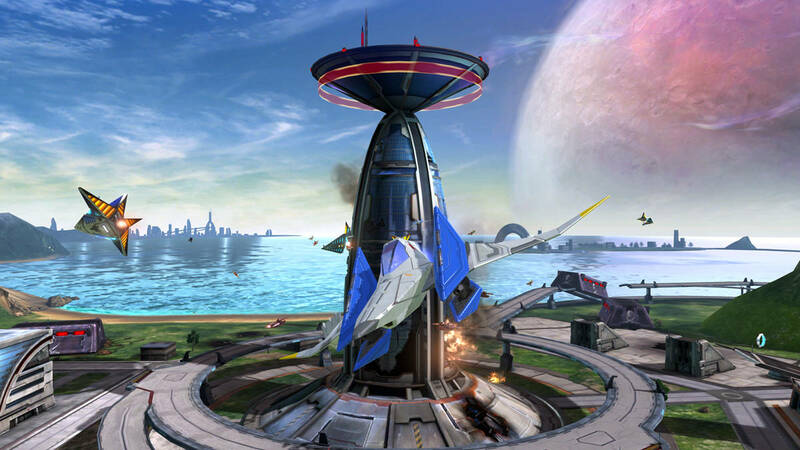 The Arwing transformations look proper, and the idea of tackling a variety of stages with different versions of the Arwing sounds like a pretty fun challenge. The subsequent Skylanders presentation looked like fun — with the Amiibo integration being a larger part of it. A large portion of Nintendo’s time for this specific game was spent pushing Amiibo. Zelda: Triforce Heroes looks good with the three-player totem system — giving the game yet another shot in the arm. Hopefully, this turns out better than the DS Zelda game with the trains. Metroid Prime Federation Force was a huge disappointment. SD character design with 4×4 multiplayer and Blast Ball doesn’t exactly scream Metroid to me. The offerings from Atlus were good, though — with a new Fire Emblem game coming out, and a Shin Megami Tensei/Fire Emblem cross (that’s what someone else told me it was; I had no clue; it was all in Japanese) that looks absolutely insane . 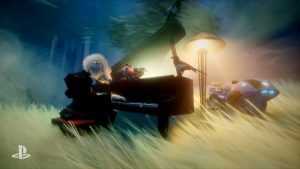 . . and I want to play it just out of sheer curiosity. The Animal Crossing stuff is a cute addition, with the designer add-on and the Amiibo Party game thrown in the mix. Yokai looks like it could be appropriately addictive, especially considering that it’s apparently the new Pokemon in Japan, has a great animation look, and relies on more than just a directional pad and buttons for mechanics. Mario & Luigi Paper Jam looks like an entertaining marriage of Paper Mario and (maaaybe?) Super Mario RPG. I loved the previous M&L games, so I’m looking forward to this — especially for how they’ll retcon the Mario Universe to fit Paper Mario and Mario Mario into the same universe. Mario Ultimate Smash looks like more Mario Sports fun; while not crazy about the other sports stuff, I always enjoyed: Kart (obviously), Golf, Tennis, and Super Strikers. It looks good! This brings us to the gorgeous, insane-looking Super Mario Maker. It looks like a pure torture device, and I can’t wait to make/play stages in it. I like that you have to be able to beat your own level to submit your design because it at least shows that it CAN be beaten while rooting out people who just throw you into an immediate rage-trap. Nintendo had a great bit about how they initially designed the first SMB to be sort of a game developing/game playing tutorial just based on simple trial and error. Fascinating watch. I wasn’t over the moon for what they had (needed more Wii U stuff, something on Metroid and Zelda at least), but enjoyed the presentation. Legitimately awkward, often boring, very disjointed. Ugh. If it wasn’t for what they had to offer, I would have tuned out within minutes. I understand that it’d been a while, but the presentation reeked of a college graduation ceremony — with less pomp and circumstance. The first presentation was Just Cause 3, part of a series for which I have a huge affinity . . . just for its batshit insane action. They somehow managed to even make explosions and chaining a helicopter to a cow to a propane tank and firing it off into the stratosphere boring. Horrible. Then they showed NIER, a JRPG that looks very pretty but showed absolutely nothing in its brief trailer. The programmers got up there, some dude in a weird skeleton-ish mask staggered onstage, and you could practically hear the audience shifting uncomfortably in their seats. 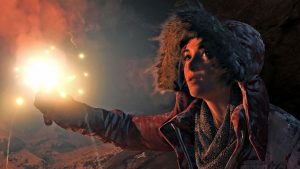 Then they saved our sanity with Rise of the Tomb Raider. It looks great — a worthy successor to the fantastic 2013 Tomb Raider, and a game I can’t wait to dive into. Then they managed to completely botch the Kingdom Hearts release by showing a really lackluster trailer for the mobile game before actually showing the Kingdom Hearts 3 trailer, which looked fabulous. Definitely should have switched them up; the last bit of wind left in there went out of the room immediately after that mobile trailer. They showed the latest addition to the Star Ocean series as well, unfortunately the gameplay just showed a lot of running and some character design while being thin on detail. I’d been on pins and needles for new Deus Ex: Mankind Divided stuff, and they delivered with a solid trailer that mixed gameplay and cinematics. It looks excellent, and I plan on losing many hours to it as I’ve done in the past with their previous games. The Final Fantasy World game looks awkward; I don’t like the young/old timeline part, but it seems like it’d be interesting and I’ll likely still play it no matter what. The Final Fantasy Portal Project seems like an odd thing to trot out — especially since other companies have offered similar features for their games for a very long time before this. SquEnix hasn’t always been on the cutting edge of things like this, though — which I sort of appreciate just because it lets them spend more time on the game dev side. Their final release was a new project called Project Setsuma from a new company called Tokyo RPG Studios. Not much detail other than some concept art. This was the first time I’d watched the pressers from E3. Normally, I’d just get the news from various blogs. I’ll never go back to blog-based E3 coverage again!